The international furor following the recent killing of Cecil the lion in Zimbabwe has inflamed the debate on the contribution to wildlife conservation of consumptive utilization in general and of sport hunting in particular. The death of Cecil has, sadly, polarized opinions making rational debate and decision making ever more difficult. 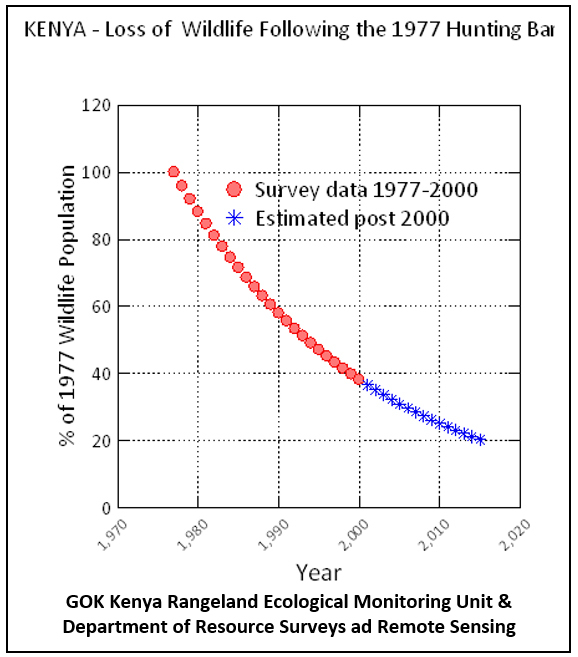 Two critical questions must be assessed: first, are positive economic benefits necessary for the long term survival and conservation of large African wildlife outside of the protected areas and second, can the sustainable, consumptive use of wildlife, especially sport hunting, contribute positively towards such benefits. The empirical evidence remains strong. Outside protected areas wildlife prospers, and more living space is made available, where there are wider rather than narrower opportunities for economic exploitation, where ownership and user rights to wildlife are more devolved to the owners and users of land rather than less devolved, where benefits flow transparently and fairly to both producers and consumers of wildlife goods and services, and where wildlife authorities adopt enabling rather than purely regulatory and enforcement roles. It is when these policy issues have been dramatically changed that we see their importance, for example in Kenya where in 1977 all consumptive use of wildlife, including sport hunting, was banned. Following the ban, opportunities for economic exploitation were restricted to photo-tourism; the state monopolized all wildlife ownership and user rights; benefit streams from consumptive utilization abruptly ceased, while those from photo-tourism were largely diverted to the service side rather than to the producer side of the industry; and the new wildlife authority (first the Department of Wildlife Conservation and Management and later the Kenya Wildlife Service) adopted a purely enforcement and regulatory role. Wildlife-generated revenues shrank from around 50% of the wildlife range supporting consumptive use to the 5% of the range supporting photo-tourism. 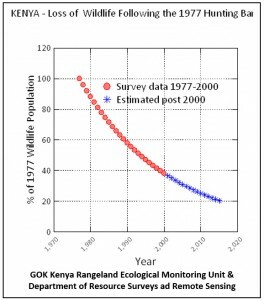 As a result wildlife production became uncompetitive compared with livestock and agricultural production and by the year 2000 Kenya had lost some 60% of her wildlife (see Figure). This loss is a telling indictment not only of a failed conservation policy but also of the abject failure and ineptitude of “professional conservationists”, Government, NGO and international alike, who sat idly by while Kenya’s wildlife vanished under their very noses despite the millions of dollars invested by them into wildlife conservation. It also speaks of the enduring influence of the animal rights lobby which opposes with great determination and success any reintroduction of consumptive wildlife use into Kenya. More recently Kenya’s grass-roots “conservancy movement” in which individual or groups of landowners and landusers have pooled their access rights has significantly improved matters. Tourist operators must now pay an agreed monthly rental for access to their land independently to the number of visiting tourists. This has swung the terms of trade in favor of the conservancies whose shareholders can now capture a much more equitable share of wildlife revenues. These ~140 conservancies now cover some 5% of wildlife range and their wildlife populations are showing clear-cut signs of recovery. While Kenya was pursuing her strict protectionist policy extensive wildlife industries developed throughout southern Africa, especially South Africa. Wildlife became, like livestock, fully fungible (in de Soto’s terminology); new legislation was passed to devolve ownership and user rights to landowners and landusers who could now capture the great majority of wildlife generated revenues; and close working relationships were forged between the state and private sectors. The two approaches do not compare well. Over the same time period of time when Kenya hemorrhaged 60% of her wildlife South Africa’s wildlife numbers increased by more than 20 times. The difference between them in terms of the added value to wildlife is particularly striking. Recently a Cape Buffalo sold for breeding at auction in South Africa for US$5,000,000: in contrast the meat from a poached buffalo in Kenya would fetch, after paying off the police and the Kenya Wildlife Service, around US$500. The economic incentives to conserve wildlife outside protected areas are typically provided by non-consumptive photo-tourism and by consumptive utilization, including sport hunting. Other incentives are clearly not economic in the strict meaning of the term. Purely social incentives are demonstrated where effortlessly wealthy individuals conserve wildlife, irrespective of cost, on extensive tracts of land, and by the money raising franchises of the eco-glitterati, “conservation bling”, focusing on high profile species (typically elephant) and conservation problems (such as anti-poaching or anti-trade). Community based projects can also yield collateral benefits for wildlife, REDD projects being particularly fashionable at the moment. It is these positive incentives which motivate landowners and landusers to use land for wildlife production rather than for livestock or agricultural production and in general throughout Africa the land used for wildlife production in response to economic incentives is significantly greater in extent than is the land set aside for non-economic reasons. We now see there are two quite different kinds of protected areas for wildlife conservation, those formally demarcated and protected by the state as National Parks, Reserves and Forests and those protected by landowners and landusers in response to economic incentives as conservancies, game farms, ranches and hunting areas. The conservation of lions demonstrates the importance of both kinds of protected areas. Lions require space because of their social system: young males leave the pride and wander far afield until they are strong enough to take over a pride by killing the resident male and his cubs. This is how Cecil took over his pride, as did his father and grandfather before him, and is how Cecil himself would have been finally deposed. Few of the state-protected areas throughout Africa are large enough to support significant numbers of lions the majority of which live on land currently protected by economic incentives. In southern Africa the wide range of economic opportunities open to landowners and landusers makes the economic landscape much more extensive and more favorable to lions than in countries like Kenya which has a very restricted range of economic opportunities, and now Botswana where trophy hunting was banned a few years ago. For lions, the policy objective must be to create as large an area as possible for economic protection. Banning or curtailing sport hunting and other consumptive utilization of wildlife, for example by placing lions onto the US Endangered Species List, will inevitably reduce the size of the areas within which lions will be tolerated thus reducing in turn both the number of lions and the numbers and diversity of other wildlife.